Meet Siphann, Siphon and Mum — devoted siblings and Citizens colleagues. Oftentimes our most reliable confidants, other times the source of rivalry or annoyance, our siblings play important roles in our lives. With over two-thirds of Americans having at least one sibling, it’s no surprise the bond that develops is incredibly important to our development. For sisters Siphann, Siphon and Mum, they are in the unique position of having one another as Citizens Bank colleagues. We sat down to hear how they came to work here and are supporting one another both personally and professionally. Tell me a little about your backgrounds? Where did you grow up? Do you all live close to one another now? Siphann: We are a family of seven total — our parents, four girls and one boy. Our parents emigrated from Cambodia when we were very young to escape the violence of the Cambodian Civil War. They wanted better lives for us, so we relocated to Rhode Island and it has been our home ever since. Siphon, Mum and I are now raising our own families here. We live in the same city and live less than a mile apart from one another. Any fun or quirky stories from your childhood you would like to share? Siphon: As kids, we loved playing hide and seek with our siblings. I was very small as a child and I remember Mum used to put Siphann and me in dressers as our hiding spots! Also, Siphann and I are twins. When we were growing up, we sometimes used to play tricks on people by switching places in school. We would take turns taking the blame whenever we got in trouble with our parents! I remember the mischief fondly. When did you each join Citizens? How did it work out that you all work here? Siphann: Siphon and I joined Citizens in 2007. I first joined a retail branch as a teller. Siphon was working at another bank at the time but was looking for an opportunity to grow. I suggested Citizens and she joined months later as a personal banker. Mum: I joined in 2013 as a teller as well. I am a mother and was looking for a role with more flexible hours that could accommodate a schedule with children. Citizens Bank was the perfect opportunity for that! Plus, I saw how much my sisters loved working here and wanted to get in on the action. What does family mean to you? How do you guys stay in touch with and support one another in the midst of busy days in the office? Mum: Family for us is a group of people that will stand beside you no matter what happens. Family tells you the truth whether you like it or not, and loves you unconditionally even if you make mistakes. Having a close-knit family is really important to us and is integral to our growth both personally and professionally. Although we don’t see one another often in our jobs, we always stay connected during the week through texting and calling. If we are having a difficult week, we are here for one another to vent and share what is on our minds. We also share career advice and tips for developing our careers. It’s wonderful to have my sisters so close by my side. 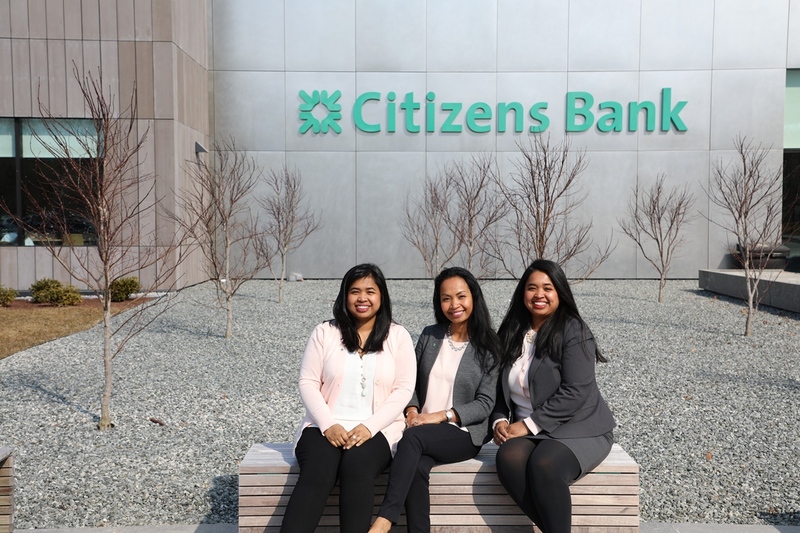 What advice do you have for people — siblings or not — who are looking to join Citizens Bank? Siphon: Citizens is a great company that invests in their colleagues and champions colleague growth and development within the company. For example, I started here as a personal banker, moved to assistant manager, was promoted to branch manager and finally became a multi-site manager. People who work hard and are committed to their own learning can really make a career here. When you are not working, what do you all like to do? Siphann: I enjoy drawing, spending time with two dogs and cat (my “fur babies” as I call them! ), hanging with friends and rooting for the Patriots. Siphon: I recently joined a gym and try to go four times a week to help me maintain focus and clear my mind. I love my fur babies too! We as a family are also big fans of a K-Pop band called BTS. We saw them twice last year and already purchased tickets for three concerts this year. Mum: With a husband, two boys and a dog myself, I’m a busy woman but I always make time for gardening! I have a green thumb and enjoy growing lots of plants and vegetables in my backyard. Our exceptional colleagues and their unique stories make Citizens a special place to work. Check out some of our other colleagues and see if you might be interested in joining the ranks of our team.